From amateur vlogger to Youtube superstar, Alfie Deyes now has over 4 million worldwide subscribers to his PointlessBlog channel. 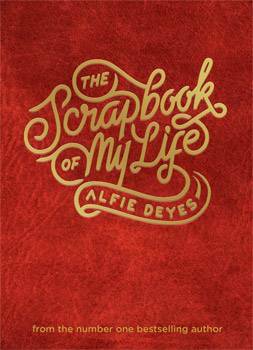 Now, for the very first time, Alfie talks about how it all began in the scrapbook of his life. Featuring photographs and revealing stories from childhood to now, readers also have the chance to record their own lives alongside Alfie's in personal scrapbook pages. The book features another free, downloadable, fully interactive App, where readers can engage with Alfie's life story and share parts of their own. The existing three Pointless Book apps have been hugely successful with over 400,000 total combined downloads. With alternate pages for readers to complete, including pages for sticking photographs, completing facts, stats and collecting souvenirs, readers will join Alfie as he recalls his first childhood memoires, his first day at school, his first ever job and how he moved from his hometown to the wide-eyed metropolis of London. The Pointless Scrapbook of My Life is the ultimate journal and another addition to the Pointless book collection. Alfie Deyes is one of the most popular online vloggers, with his Youtube videos reaching almost five million subscribers across the globe. He is the author of the number one bestsellers, The Pointless Book and The Pointless Book 2 and his popularity and reach is ever growing. Question: What originally motivated you to begin PointlessBlog? Alfie Deyes: I loved seeing the interaction between other YouTubers and their audience. No-one else in school watched YouTube like my friends and me. We didn't visit the site to watch dogs riding skateboards or cats falling off walls….well, occasionally we did, but mostly we watched YouTubers. There weren't many YouTubers around at the time, so there wasn't much variety but I think the reason I became so obsessed with watching them was because they were just being themselves. They weren't acting, they weren't even reading a script, they were just chatting about topics that interested them or filming what they got up to that day. It felt like such a refreshing change from scripted TV shows because the person behind the camera was just like you, a normal person! Question: From there what inspired The Scrapbook of My Life? Alfie Deyes: My viewers can watch what's happened to me in the last six years of my life so easily, because of all the videos on YouTube, but they aren't able to see what I've been up to in my life before I started YouTube. So I wanted to write a book that looked at my earlier years. I raided my parent's photo albums and chatted to them about stories from when I was little, and I wrote about fun memories. It was so much fun pulling it all together. Question: Can you tell us about the app that supports The Scrapbook of My Life? Alfie Deyes: There's tons of embarrassing childhood videos - of me in the bath, me on family holidays, in school plays, in gymnastics competitions. These are just videos that my family and friends have filmed throughout my life that haven't been seen anywhere before. I'm going through all the footage now and there's so much. There'll also be a memory booth for readers to share some of their photos. It'll be ready to download next month. I know Alfie, come on!! Question: Was it difficult to relive any aspects of your life during the creation of The Scrapbook of My Life? Alfie Deyes: No, I've loved every minute of it. I've had some amazing adventures and met some awesome people along the way and I wanted to share it with everyone. The book is a piece of me. Each page freezes a moment of my life in time. Question: What's next for the PointlessBlog? Alfie Deyes: I don't really know. There are so many random opportunities that come along that I just take every day as it comes and make sure that I'm having as much fun as possible doing what I'm doing. I honestly believe that the more fun I'm having, the more fun the audience watching is having.